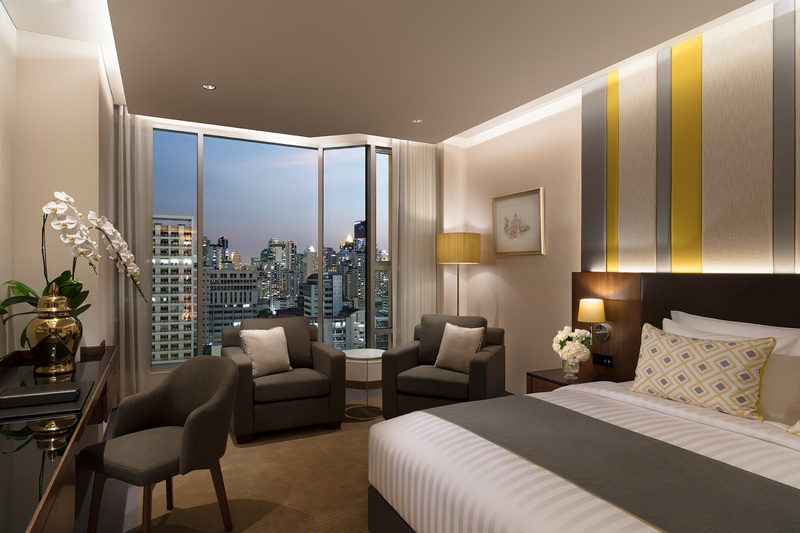 There are hotels aplenty in Bangkok, but since opening just over a year ago, the Lancaster Bangkok has been drawing guests to the city’s Makkasan District with a careful blend of bright, contemporary aesthetics, warm Thai hospitality, well-thought-out facilities, and a great location. Part of Preferred Hotels & Resorts‘ Lifestyle collection, the Lancaster Bangkok offers comfort, style and service in a relaxed, fun atmosphere. Here are six reasons to check into this laid-back hotel next time your’e in town. 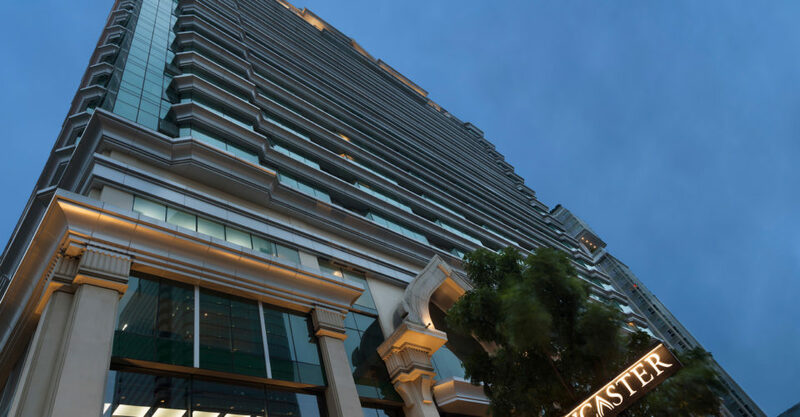 Occupying pride of place on one of Bangkok’s major thoroughfares, it’s hard to beat the Lancaster Bangkok’s location in the Makkasan District. Just a five-minute walk from the hotel you’ll find the Singha Complex which houses a range of casual eateries and wellness options. You’re also a quick walk to the city’s metro system (though there’s also a complimentary shuttle tuk-tuk if you’re feeling a bit lazy) , which puts you within reach of the city’s major attractions within minutes. Whether your goal is shopping, sightseeing or drinking and eating, you’re well-placed to get anywhere, fast. The best part? Getting to and from the airport is a breeze since you can drive straight onto the highway, or pick up the direct airport rail link nearby. Bangkok can definitely induce a bit of sensory overload. Luckily, if the city gets to be a little too much, the Lancaster Bangkok has its very own wellness haven. Viva Jiva is a sophisticated two-level spa offering holistic modern therapies. Book ahead and slip in for a few hours of pampering. On the menu? Massages by Aromatherapy Associates, facials by Anne Semonin, traditional Thai treatments, and a number of grooming options. Round out your retreat with the spa’s full-service facilities, which includes a steam room, sauna, and ice therapy space. Block off some time to spend an afternoon lounging on the rooftop pool, and if you’re feeling active, perhaps work up a sweat at Viva Fit, the 500sqm gym stocked with state-of-the-art Precor and Cybex equipment. The Lancaster Bangkok features 231 guest rooms and suites. Each one is expansive and well-designed, — and most feature unique views of the city. Rendered in earthy tones of creams, whites and browns — with modern accents of glass and wood — rooms feature comfy seating, floor-to-ceiling windows, and an expansive desk with plenty of space to do some work. There’s even a bedside tablet filled with information, suggestions, and booking features. The highlight, though, is the giant, glass-encased marble bathrooms that come with giant walk-in rain showers and separate soak tubs. Longer stays should consider the 70sqm apartments or 72sqm suites that come with a fully-equipped kitchen, while families should check out the family rooms that offer two bedrooms and a lounge for relaxing. 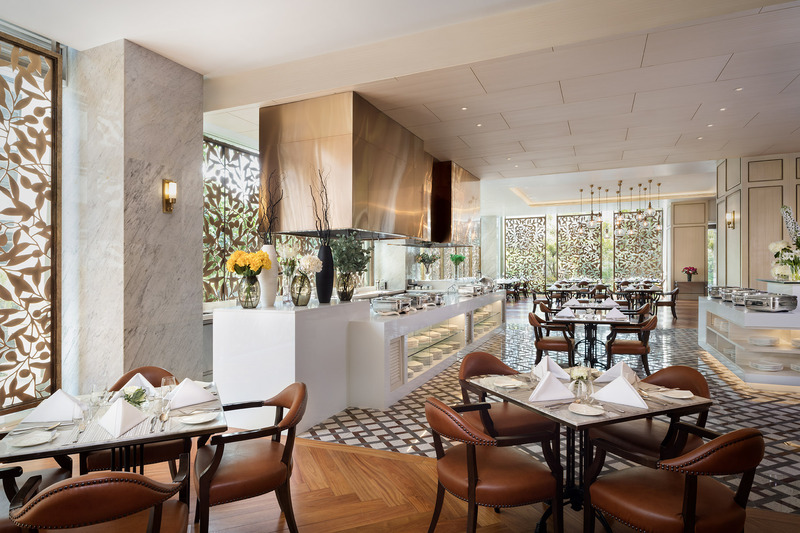 The Lancaster Bangkok features a chic restaurant and two bars that are a great choice for quiet dining and socializing. The main outlet, Siam Brasserie, is a stylish spot offering a full range of food and all-day service. You’ll find everything from authentic Thai dishes and well-executed Western plates, as well as seafood buffets and lazy Sunday brunches. If you’re going to miss the breakfast service, you can request a packed meal to take with you or have delivered to your room at an ungodly hour. The Lancaster Bar is a great space for a casual aperitif or nightcap. Sink into one of the cozy chairs to enjoy Thai tapas, craft cocktails, local beers, and afternoon tea. For something a little special, head upstairs to the High Bar. 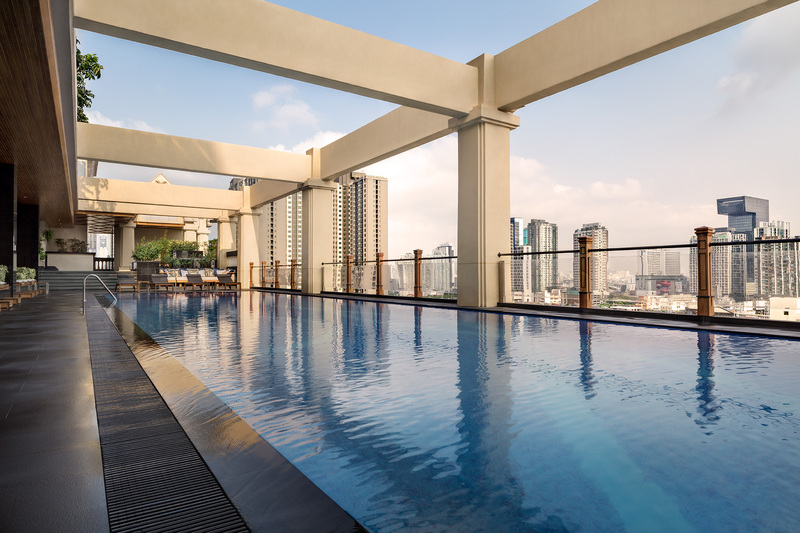 This poolside bar offers sweeping views of downtown Bangkok along with a menu of refreshing juices and smoothies, great cocktails, and light bites. Thanks to great healthcare facilities, Bangkok has become something of a medical tourism destination in its own right. The Lancaster Bangkok recognizes this, and is one of the few hotels in the city to cater to visitors who come to Bangkok for medical treatments. The hotel offers an array of amenities to guests who undergo medical treatments in Bangkok and need a calm, quiet place to recuperate. near world-class private and public hospitals. The hotel can arrange hospital transfers, adjustable beds, special access to the wellness facilities with specialised spa treatments, doctor on call, tailor-made meals assist with referrals and admissions to hospitals. 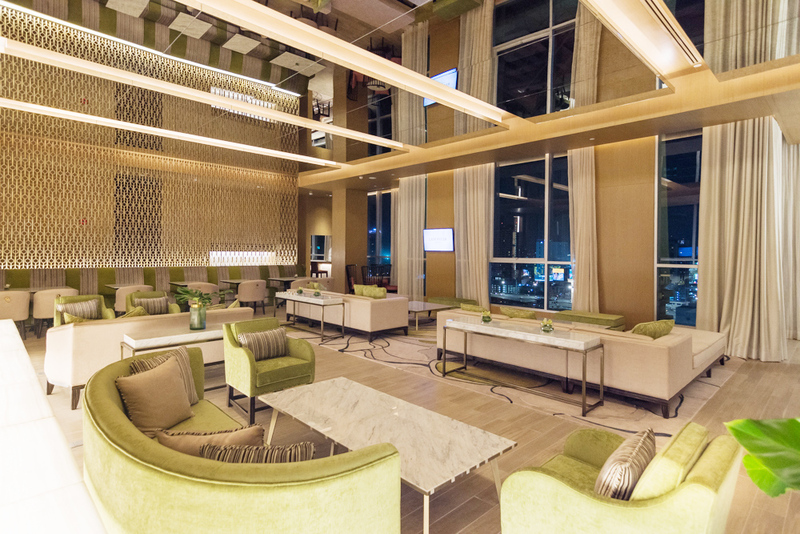 As the Lancaster Bangkok’s executive lounge, Club Lancaster offers everything you’d expect from a well-thought-out hotel lounge paired with attentive yet discrete Thai hospitality. In the bright, stylish space, the main offering is the all-day refreshments which includes breakfasts with made-to-order meals, afternoon tea, and evening aperitifs with canapés. Of course, you’ll also get all the other expected amenities including meeting facilities, laundry and bespoke services. Note: The author stayed as a guest of the Lancaster Bangkok and Preferred Hotels & Resorts.